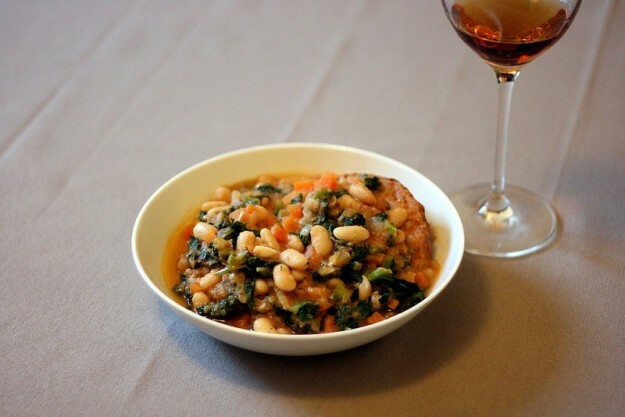 The weather’s a bit sharp this week here in Tuscany so I thought nothing would be better than a nice steaming bowl of ribollita to warm both the soul and body up. This typical dish is considered a poor one, belonging to the Tuscan peasant tradition, where meat is substituted by bread. The soup used to be cooked in large amounts in a clay pot and be heated during the following days, thence the name ribollita meaning “boiled again”. Today this dish is a speciality you can find on the menu of Tuscan restaurants. This bread soup is a typical winter recipe with seasonal ingredients such as kale and Savoy cabbage. Tuscan farmers state that the dish is better if the kale has ‘frozen’, meaning been caught up in a couple of frosty nights so as the leaves be softened. 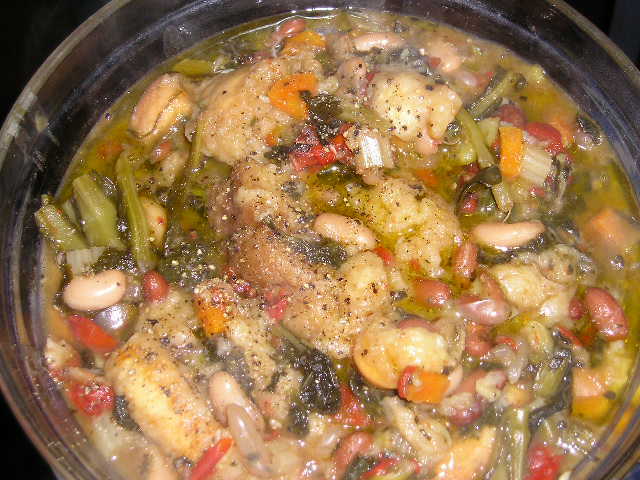 Other fundamental ingredients are the typical cannellini bean and Tuscan unsalted bread. The dry cannellini beans must be slowly boiled in plenty of water with a couple of tablespoons of olive oil, a tomato, a clove of garlic, some sage and salt. Once cooked mash more than half of the beans with a fork with their cooking water and leave the rest aside. In a pot fry some sliced onion and garlic in olive oil, then add diced carrot, celery and tomatoes. 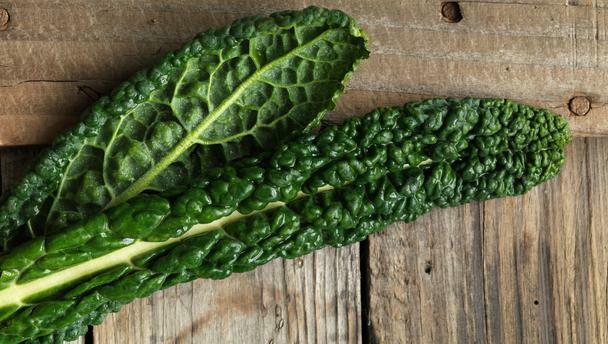 Cook them on a medium heat for a few minutes and then add the shredded kale, Savoy cabbage and some Swiss chard. Let everything sweat in its juice and then add the mashed beans. Cover with plenty of hot water and let it simmer for an hour over medium heat, or at last until the kale’s leaves are tender. Add the whole beans kept on the side, season with salt and pepper. Stir frequently, because beans tend to stick to the bottom, for 10 minutes. Slice the (no less than) 2 day old stale Tuscan white unsalted bread, place in the soup bowls at least 2 layers of bread and pour the boiling soup over. Let it rest for a couple of minutes, pour a trickle of extra virgin olive oil on it and serve with an excellent glass of red Tuscan Chianti wine. Buon appetito! Questa voce è stata pubblicata in Accommodations in Tuscany, Tuscan food and wine, Tuscan lifestyle, Tuscan recipes e contrassegnata con Chianti wine, ribollita, Tuscan lifestyle, Tuscan recipe. Contrassegna il permalink.